The Two-Part Formula is a simple and effective method for bringing about a permanent awakening, that is, a dropping off of the illusion of self. It's about being aware of one's sense of self and observing it systematically. Applying the two-part formula doesn't differ from the way a scientist carries out a careful examination. It's about examining the mind, looking into one's own psychology in a particular way. When you really immerse yourself in applying the Two-Part Formula, it can bring about awakening. Awakening happens on the level of your mind and is a permanent state, not a temporary experience. The Two-Part Formula is a spiritual-psychological technique, which can produce a significant shift in one's mind and thereby in one’s life as well. It's about illuminating the most significant cause of dissatisfaction from one's mind stream. Overall, awakening is a central theme in all time-tested spiritual traditions. Even though the Two-Part Formula deals directly with the primary factor in the existential dilemma and is easy to apply, it is useful to have one-on-one contact with an awakened person or a teacher who understands first-hand what awakening is and who can therefore provide helpful pointers. That being said, when awakening happens, it dissolves the problem. So one simple indication of awakening is that you no longer need to seek or find anything because the seeker has dissolved away. 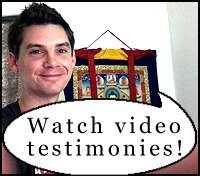 The majority of authentic dharma teachers should be able to tell you if a shift has happened or not. Before you read on, I have one request: Drop all pre-assumptions you may have concerning awakening and spirituality. Forget that you ever practiced meditation, read spiritual books or received spiritual teachings. Have a totally open mind. Start fresh without baggage. This is essential. First, sit down and relax thoroughly. Take a comfortable seat with eyes open or closed. Then scan through your body with attention and release tensions from anywhere you notice them. Scanning the body means that you look, feel and listen into the body space and scan around it as if using a flashlight in a dark house. When some tension is found and is allowed to release, pay close attention to what is found in the area of that released tension. Look closely. What you find is mere open space. After you notice this move on to next tension, release it, and again notice the open inner space in the place of the former tension. After you have done this for several minutes with some sharpness of attention, what happens is that the small locations of open space become connected and a greater open space becomes revealed. Notice and enjoy that spaciousness. Marinate in it for several minutes. This mode is called the ”I-less mode” because in this spaciousness there is no ”me” or ”you”. As you are in that experience of spaciousness, see if ”me” or ”I” can be found there. Check whether ”I” is there or not. Check left and right. Check front and back. Check up and down. Check the center as well. Can you find the sense of me-ness from this spacious mind? If you cannot find it, the recognition of the I-less mode is correct. If you are not sure, then do the exercise again and look with sharper attention. In this mode, when you listen to a sound or look at some external object in front of you, there is no ”hearer” or ”seer” but rather there is only ”hearing and ”seeing”. It is important to recognise this selfless mode well. It is not difficult, you just need to apply some attention and relax properly. Say to yourself "I, I, I", "me, me, me" or "mine, mine, mine", aloud or silently, with conviction, so that you mean it. Repeat the affirmation 2-3 times and then for a moment wait for sensations to arise. How does it feel? Do you feel some tensions arising? Do you feel some lack of freedom when you reinforce the I-thought? How does the I-thought feel? You have consciously brought up the sense of me-ness and are now consciously experiencing how your sense of me-ness feels, perhaps for the first time in your life. The subject, me, now becomes an object that can be observed. Make note of how me-ness feels all over your body, in the chest and the head. Pick the strongest of these sensations and observe it more closely, just like a scientist does when looking at an organism under a microscope, not to change anything but just to study it with great interest. Consciously look and feel the sensation and simply by experiencing it, make observations about it. How is the I-thought? Does it have a shape? What's the size of it? Where is it located? Is this experience of me-ness the truth of you? Is that the real ”you” or not? Look carefully and make observations. After some time, the I-sensations disappear. If at that point you still feel calm and not agitated, you can do another set of affirmations. If one the other hand you feel a bit restless, look into that restlessness to find out what's causing it. When these sensations eventually subside the spaciousness again becomes revealed and so the formula begins again from the first step. The idea is that you keep comparing the two modes until the sense of me-ness wears out. At some point when the affirmation no longer sticks and the affirmation, no matter how intensely you say it, just echoes into empty space, awakening has more than likely taken place. At this point, you can feel a special kind of openness and elation, lightness and unobstructedness, when compared to before. When practicing the Two-Part Formula, it is best to sit down and process the two modes silently 1-2-3 times a day for 20-30 minutes at each sitting. These sitting sessions are essential along with processing during activities. In activities, whatever they may be, make note of how the two modes alternate. Also, when we are around others the ”I” can come up unexpectedly and strongly because we are used to reacting to other people from our sense of ”I”. Make use of these moments to look into the self or ”I” with awareness. The first mode of the formula demonstrates that when the tensions are thoroughly released the landscape of your mind also changes. Thoughts disappear, emotions settle and a mind-space like a cloudless sky becomes revealed in your mind. Eyes see and the ears hear but the “I”, “me”, or experiencer is not there. There’s no “I” or owner in direct perception. There’s only a spacious state of mind, a spacious inner state. You have to find this out for yourself. Anyone can do it. Even a short glimpse of a second or two into that spaciousness gives you something to work with. It doesn't have to be perfectly spacious and clear all the time. Just do your best. The selfless, spacious mind can be briefly recognised in any situation, whether in silence or during activities, whether alone or amongst other people. Take this spaciousness just as it is. All questions dissolve in that space if you just relax enough. Don’t add anything to this state. If you look for a self, me, from the spacious mind, can you find it? If you find some sensation in your bodymind, look and investigate what it is. If the assumption is that your self, your sense of me-ness, is a real constant being, a stable entity, then surely it should be found somewhere, but is it there all the time? ”Me” or ”I” cannot be found in any other way except as a thought in your mind, which comes and goes according to likes and dislikes. When you mind is clear and peaceful, ”you” are not there. In the second mode, the sense of self is purposefully reinforced with the affirmations so that we can become aware of it in a very specific manner. If you look into your sense of self you come to know that ”I” am actually a bundle of thoughts, emotions and impressions squeezed into a kind of knot. This knot has formed over time through many different situations and experiences since birth and it is this very knot who we imagine ourselves to be. We have created ourselves and by doing so have gone astray, have left our true abode, so to speak. We have assumed that these feelings, thoughts and experiences are our “self” or ”me”. When applying the formula we have to examine if the feeling of self is a solid, immutable and stable character. Is the self something that is a stable, permanent element that is always there? Simply examine the feeling of self. Look directly at its center, its core. These are the steps of the Two-Part Formula. It’s necessary to thoroughly apply the two modes and bring awareness to that subconscious “thing” that we call our ”self”. Eventually, if you correctly apply the formula, a shift will occur. All of a sudden it is like the sky becoming bright and clear after a long spell of rain. All of a sudden your mind becomes bright and being becomes effortless. Even the physical body itself may feel elated and healthy.